One of the preschools affected by the 1995 Oklahoma City bombing, the YMCA Child Development Center has since relocated to a new facility just a few blocks away with the help of donations from the Gaylord Foundation. The Center was looking to replace their old, bland playground structure with something more age-appropriate and inclusive. Our Playworld representative envisioned a whimsical, colorful, garden-themed playground with two unique zones: one for infants ages 6-24 months and one for kids ages 2-5. The infant area includes a variety of sensory panels and a special ground-level bridge for toddlers learning to walk, while the other zone offers a more challenging, traditional playground experience. 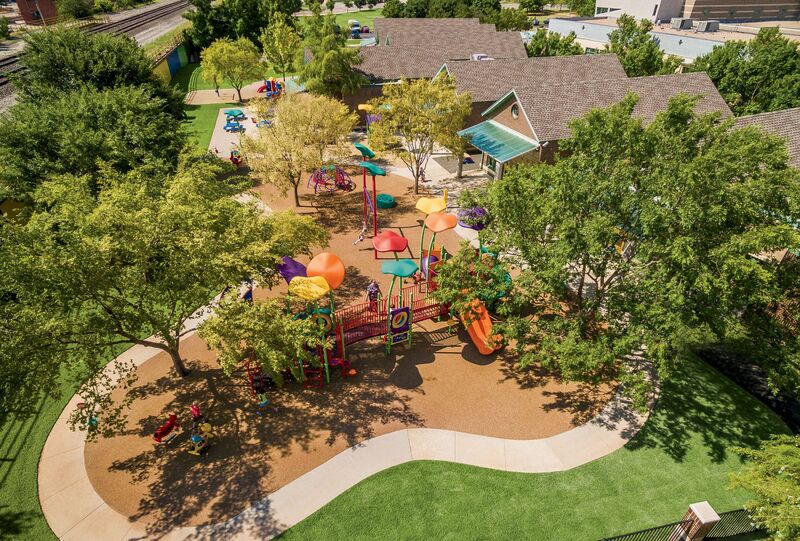 Playworld worked to design the space around the the existing trees and tricycle path to minimize demolition costs and create a naturally integrated aesthetic. PlayTown activities like the Gas Station and stop signs are placed along the edge of the trike path to encourage both imaginative play and critical thinking skills. Curved LolliTop™ roofs, posts, and components take inspiration from the YMCA’s logo, bringing a rainbow of color and playfulness to the space. Additionally, poured in place surfacing, ground level play events, and a Cozy Cocoon™ enable kids of all abilities to play together—something that wasn’t possible with their previous playground. The space has been well received by the kids, teachers, and parents alike. “Thank you so much for the added joy!” one parent writes. Now the Center can put aside the lingering memories of tragedy, and focus on the bright, happy future ahead.